SWIMRUN RACING. WHAT’S IT ALL ABOUT? Competitors race over a course that comprises of multiple swims and runs back to back, over varying distances for each leg. Typically, these are off-road and trail runs but the swims may be either lakes or sea swims depending on the location. 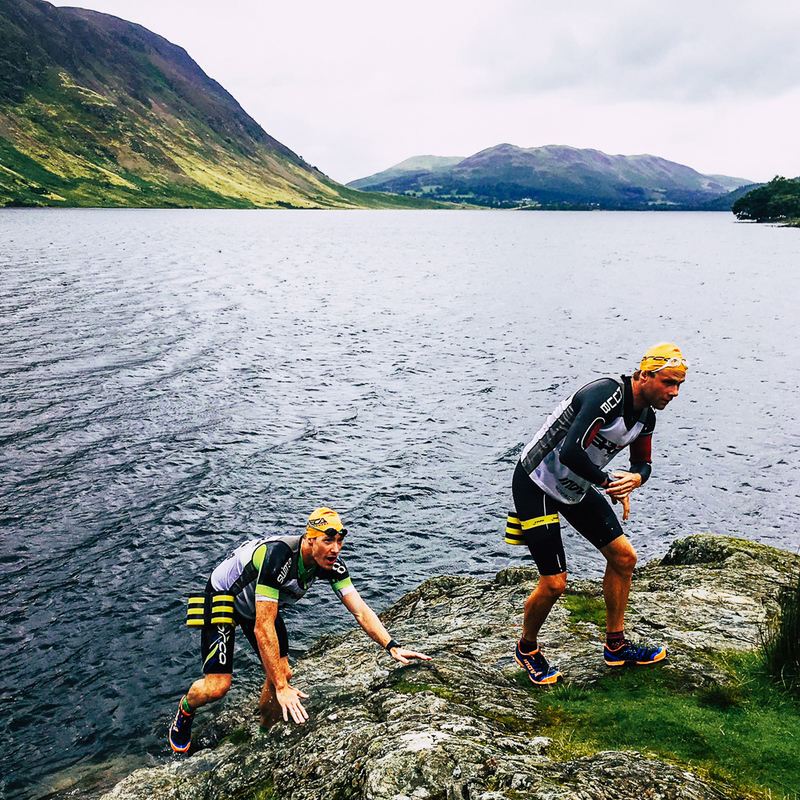 Unlike triathlon, where athletes have a transition zone between each discipline where they can change equipment, the point-to-point nature of swimrun requires athletes to carry all their equipment throughout the duration of the race. This means swimming in their trainers and running in a wetsuit. Aid stations are provided but many events require competitors to carry their own collapsible cups or soft-flasks. One of the big draws to swimrun from the multisport community is the purity of the sport and it’s relative “back to basics” approach. In triathlon, the bike leg can be largely influenced by the technology and therefore cost behind the bike you choose. As Ben de Rivaz, Founder of Breca Swimrun, says; “In swimrun, you can’t buy your way to the finish, it’s all on you”. Another huge draw to the sport is the opportunity to race in some of the most beautiful parts of the country, over challenging terrain and lakes with beautiful views. Swimrun is largely ungoverned by rules too. Besides basic safety equipment; wetsuit, whistles, water bottle & trail shoes, there’s a lot of room for customisation and kit selection. While swimrun specific wetsuits are becoming more widely available, many still choose to customise their own from an old triathlon wetsuit. You can do this by cutting the legs and perhaps arms (depending on the temperature of your race location). The use of swim aids such as pull buoys and paddles are permitted, which many athletes choose to use. This isn’t advisable for everyone, however, while paddles increase propulsion, they effectively gear-up your stroke, like riding a higher gear on a bike. It’s quicker, but only if you have the strength to sustain the effort. With races having over 5 km of swimming it’s likely your stroke technique and speed may suffer. The two largest race organisers are Ötillö and Breca with five races between them in the UK. But other races are popping up all the time. Most races offer a full distance as well as a shorter ‘sprint’ option, however, these are still quite a challenge. Once you’ve decided on a race, look at some of the top training tips that are available on the race organisers website. Breca have started to do a ‘Beginner’s Guide’ set of videos on their YouTube channel, so we recommend you check that out. As well as getting enough distance in your swim and run training separately, we’d advise you spend a lot of time experimenting with your race kit set up. Learning to run in a wetsuit and swim in open water in your shoes takes some getting used to. You’ll want to experiment with things like your layering underneath your suit, how to take the suit on and off your upper body while on the go, known as “cabbing down”, this is advisable on the longer runs to prevent overheating. Keep an eye out on our website and social media to follow articles and training advice for this new and awesome sport.